Last year in September I signed up at UK platform Bondmason in order to test first-hand how an investment of 1,000 GBP would develop. As described in the review article, I wrote when I started, Bondmason is an aggregator that automates the investment across many p2p lending platforms for the investor and takes a fee for that. Bondmason projected a target return of 7% after fees and bad debt. Allocation of my deposited funds into loans went okay. There was some cash drag, but not as much as other investors have experienced. What was bad, was that it became clear to me, that the interest level in combination with the non-performing loans would make it very unlikely for Bondmason to reach the projected return – at least for my portfolio. Especially with the Invoice Discounting loans there were issues. In April 2017 Bondmason announced it would require a larger minimum investment amount of 5K (previously 1K) and raise fees for small portfolios to 1.5% (previously 1%). Dang. I was in no way interested to deposit more money. So my portfolio did not even get to celebrate 1st anniversary. In July I gave them notice to liquidate my portfolio/account. Since then I withdrew 1,013.94 GBP – only slightly more than I deposited. My account still exists as there is 20 GBP stuck in two property loans in default and also 1.41 GBP in cash. Regardless of which way I look at it, the result is clearly bad. Obviously Bondmason by far missed the targeted return of 7% in my case. If I take an optimistic view and just assume, my 2 defaulted loans would recover today and the outstanding amount is paid to me, then my self-calculated yield (XIRR function) would be 4.3%. If I need to write off the 2 loans in default then my self-calculated yield is 1.9%. And that is before tax – as a German resident I cannot offset bad debt against interest earned for tax purposes. And on top of that the pound has been detoriating against the Euro value in the past 12 months (not Bondmason’s fault). So to sum up: I liked the idea of an aggregator and the Bondmason setup allows passive investing in a diversified mix of p2p loans. 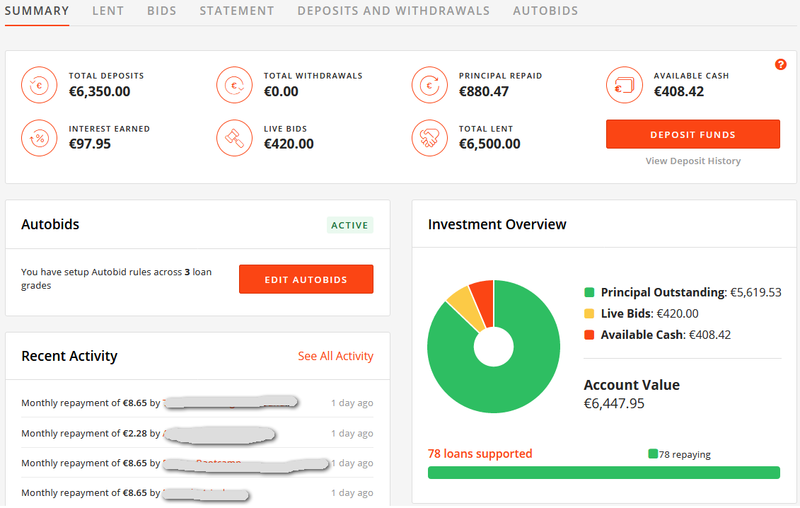 But my returns are among the worst I ever experienced on p2p lending platforms and I am certainly happy I conducted this test with 1,000 GBP only and did not risk more. If you want more details about the development of my portfolio throughout the past year there are more snapshots with screenshots over time in this thread. 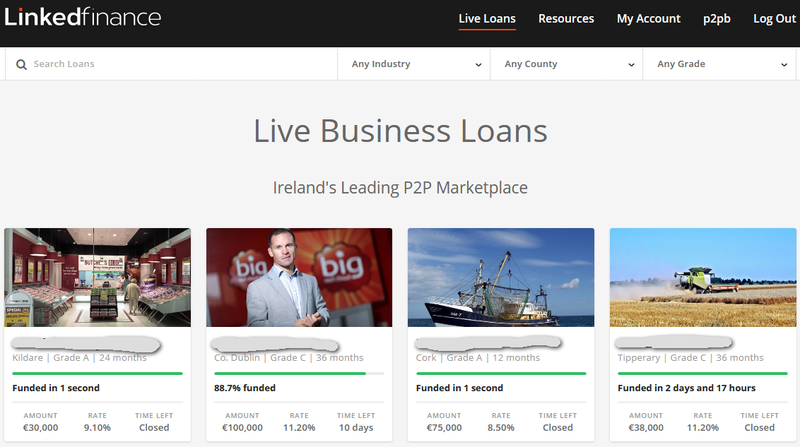 Six months ago I started a portfolio on Irish p2p lending platform Linked Finance. 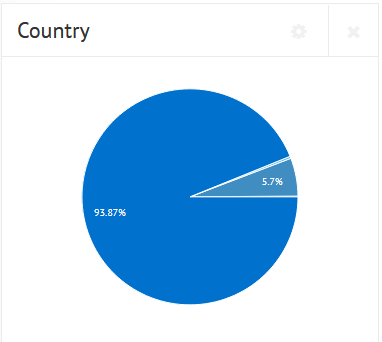 As my overall p2p lending investment was heavy on Baltic and UK platforms I wanted to diversify geographically. And Linked Finance is an established player. The marketplace started 4 years ago and attracted institutional capital earlier this year. I started in February with a 1,000 Euro deposit via SEPA transfer. Loans on Linked Finance have terms of either 12, 24 or 36 months and are assigned credit grades by Linked Finance. Both together determine the interest rate. 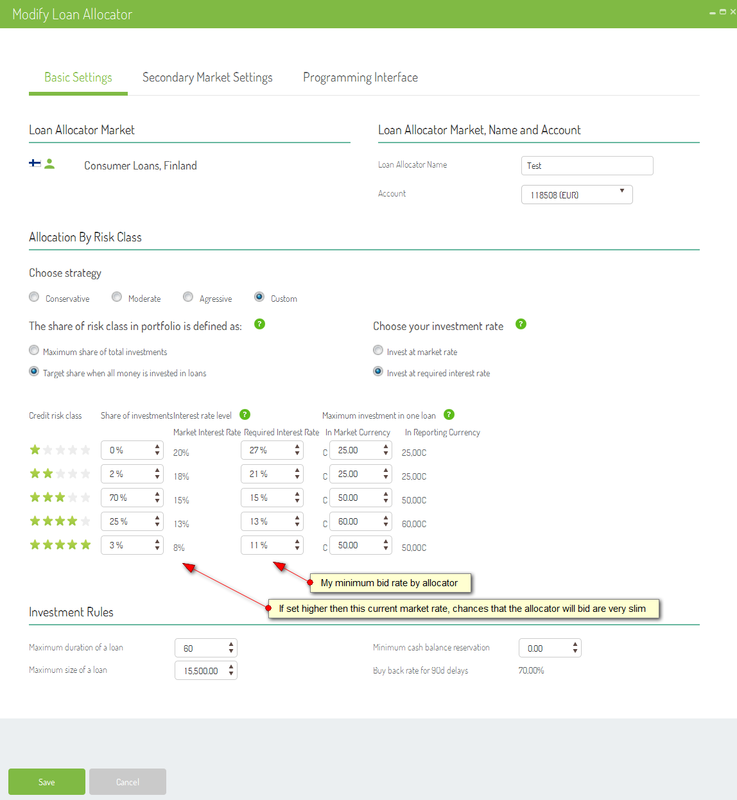 I use the Autobid (autoinvest function) to invest. While it is possible to make manual bids, many of the smaller loans are funded in minutes. Over time I have done multiple deposits and increased my total deposited investment to 6,350 Euro. The processes are smooth, there have been no bugs and Linked Finance is a most hands-off platform requiring almost no attention by me. Loan supply is a little volatile. It has slowed down in summer. However most loans are for 36 months; due to my autobid settings I skip many of those. My self calculated ROI so far is 5.6% (XIRR), but some of that is due to the initial cash drag and this figure will rise. 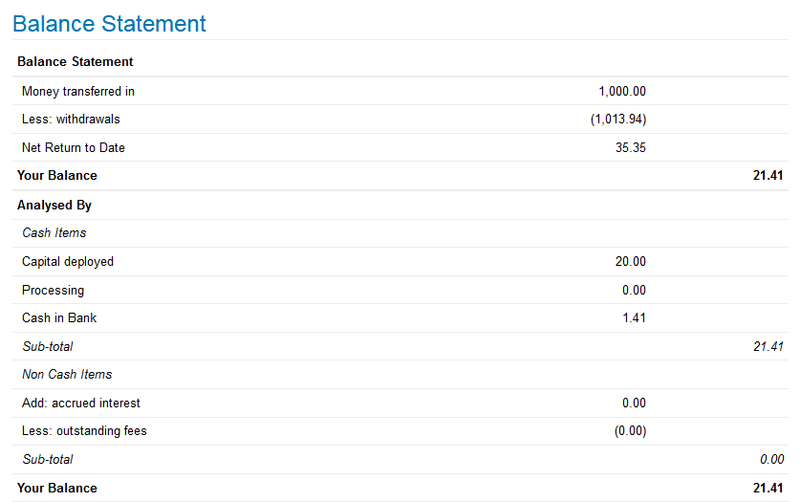 I plan to further increase my Linked Finance investment to a portfolio size of 10K. Another, very recently launched Irish p2p lending marketplace is Flender, which currently runs a 10% cashback promotion (minimum investment of 2,500 Euro to be eligible). Investors that want todiversify their investment across p2p lending marketplaces in Europe find a list of options here. Initially all loans had carried 12% interest. Now Lendy assigns different interest rates to each loan. Interest range for investors on new loans now are in the range between 7 and 12%. Lendy sold the security of the second defaulted loan (Garden Center). While all lenders got principal and interest paid on this loan, the sale price of the security was below the loan amount. Lendy covered the shortfall from own funds (provision fund). 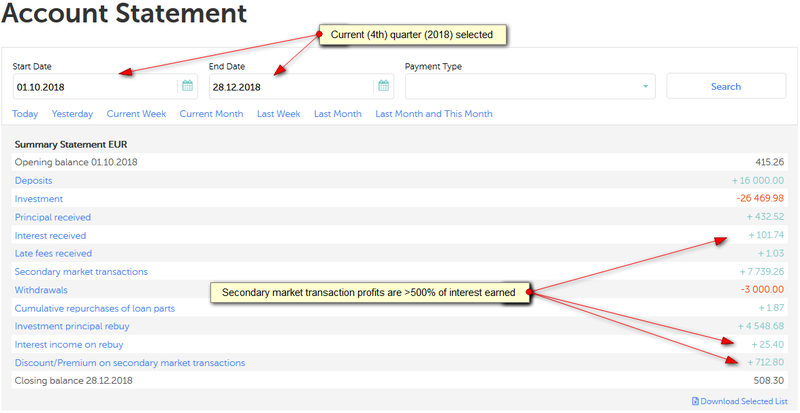 Since March 2017 investor can not buy loans on the secondary market and deposit funds afterwards (this still is possible on the primary market). This has reduced liquidity of the secondary market somewhat, but in general it is still pretty liquid for those loans that have a middle to long remaining term. Since April 2017 there is a new default policy in effect. For loans more than 90 days overdue interest continues to accrue but will not be paid until Lendy has received payment by the borrower. All loans more than 180 days overdue are now automatically classified as default loans. The number of defaulted loans has risen to 14 at the time of this writing. Especially the last point has triggered debates on the chances for recovery and there are concerns voiced among investors about to optimistic valuations. The secondary market swings from time to time between mosty empty (except for loans in default) and plenty. I have continued to ramp up my portfolio reinvesting returns and making new deposits via Transferwise and Currencyfair. This was before the Brexit decision. As for now I am simply reinvesting. 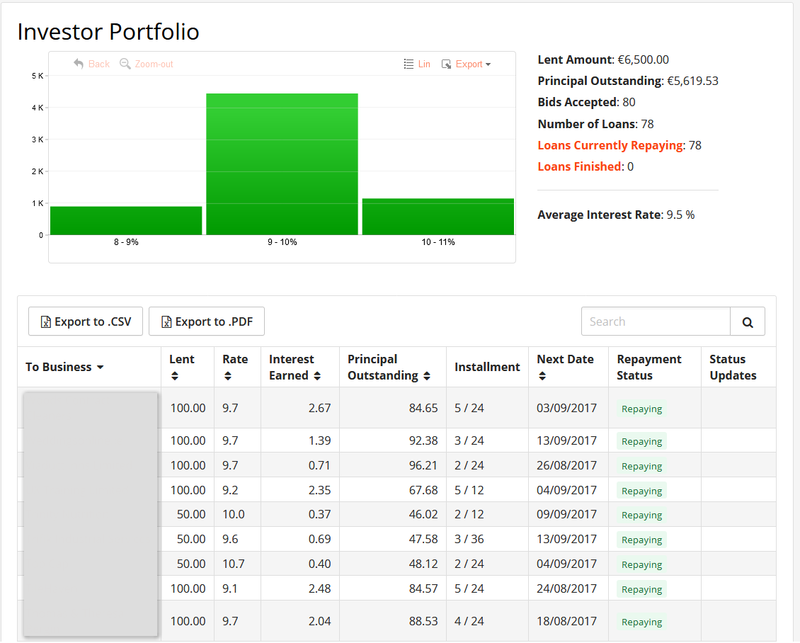 My portfolio amount is 10K GBP spread out over 14 different loans. The vast majority is in 12% interest rate loans. I have made three exceptions in the past, but usually only with low amounts and when rebalancing the portfolio, I try to sell these lower interest loans first. 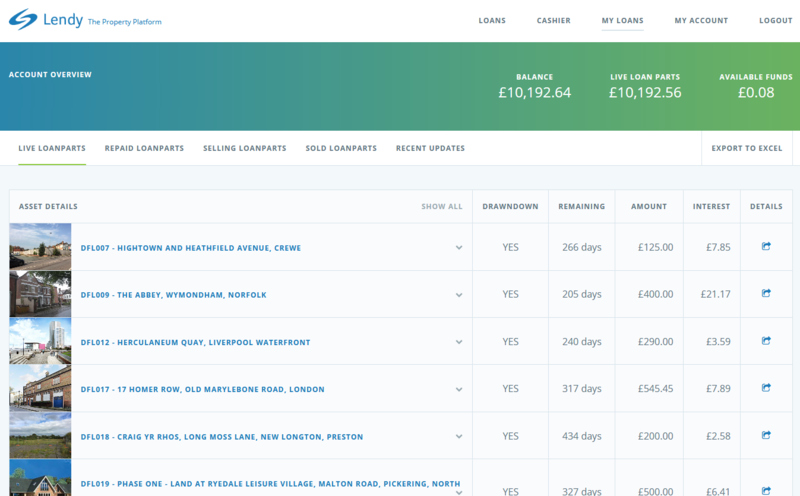 So far I have not had any loans in overdue or default state – but there are many of those on the platform (see above). My loans have long remaining terms with the shortest being 147 days at the moment. My yield (self calculated with XIRR) so far is 12.1% in GBP. Unfortunately I deposited most funds during the time when the pound was at a high, therefore calculated in Euro currency the yield is only 4.4% for me. Lendy is still one of my preferred p2p lending marketplaces, due to interest rates, real estate as a security and liquidity. I do see the risks in the valuations, but I figure that at least the security will cover part of the loan amount and will with a high probability prevent total loss in a defaulted loan. I might get more picky in selecting loans, but so far Lendy for me is actually a platform that requires less management and monitoring than several other marketplaces I use. Last year I started investing on British p2p lending marketplace Moneything. Read my past article about opening a Moneything account. Moneything mostly offers property backed loans, with a few different asset-backed deals in between. I used Transferwise and Currencyfair to deposit money from my Euro account. Recently I also used the Revolut App to transfer money from another UK p2p lending marketplace to Moneything. 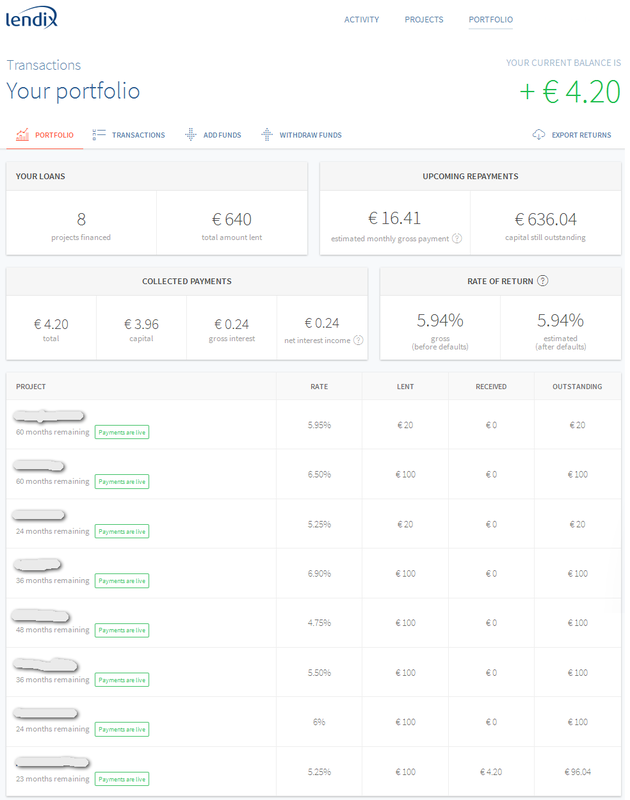 Looking back over the past year my experience with investing on Moneything has been very good. I am invested in 31 loans right now, mostly at 12% interest rate with small amounts also at 10.5%, 11% and 13% invested. I have had no defaults and there are no fees for investors. The website functions well and support is reported to be very responsive (I actually did not need it yet). The secondary market is extremly liquid, loan parts often sell within second. 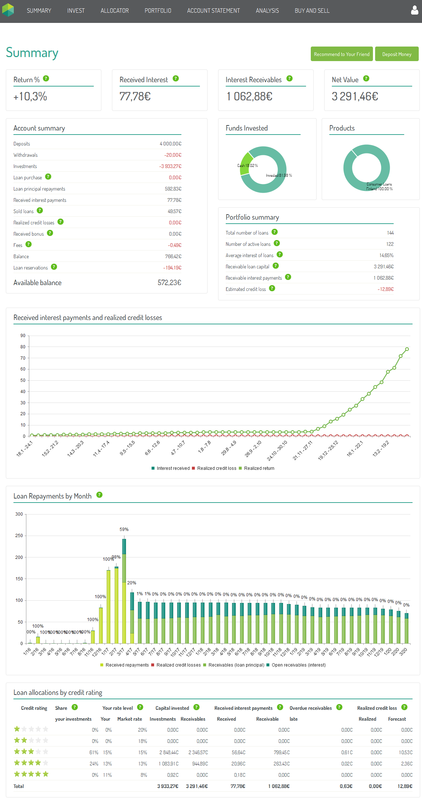 The only two minor downsides of the Moneything platforms for me are that investor demand by far outstrip loan offers. 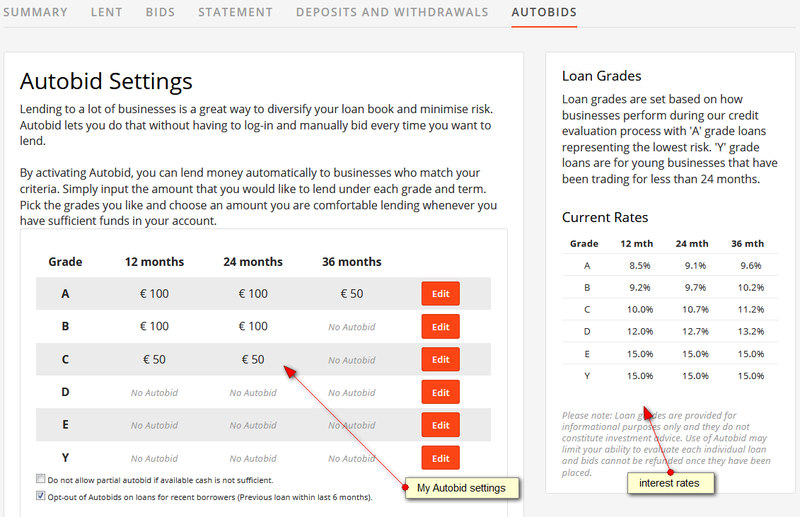 And there is no autoinvest, so usually it is necessary to login shortly after 4pm UK to invest into new loans. My yield (self calculated with XIRR) so far is 12.0% in GBP. However due to currency fluctuation in EUR it is only 7.2% at the moment. So if all is great, why did I not invest more? Well, I planned to, but shortly after I started, Brexit vote took me by surprise and I abandonned my plans to ramp up my investment amount, due to the higher currency volatility uncertainty. Instead I am now mainly reinvesting funds and in addition add funds already in GBP, which I move over from other UK platforms via Revolut. 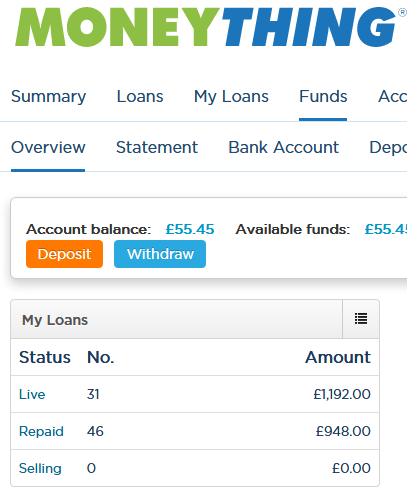 Earlier this month Moneything gained full FCA approval. This is the prerequisite for launching an IFISA product, which allows tax-free investing for UK investors (compare IFISA providers in our database). Surprisingly Moneything just said, they are in no hurry to launch an IFISA offer but rather wants to built loan originations first. This makes sense because the increased deposit influx by an IFISA offer would imbalance demand and supply even further. A year has passed since I last wrote about the portfolio I built on Finbee. For a detailed description of this Lithuanian p2p lending marketplace see my earlier review. As described there, I invested mostly in the highest risk grade loans (‘D’ loans). Currently I have invested 1,027 Euro in 35 loans. 32 are current (965 Euro), 2 are late (23 Euro) and one is in default (38 Euro), but rates for this loan are paid to me by Finbee’s compensation fund. The average interest rate of my loan parts is 31%. Interim I had grown my portfolio to up to 3,000 Euro invested, but interest rates have decreased due to high investor demand that was not met by comparable growth on the borrower side, so I have withdrawn 2,604 Euro meanwhile. My self calculated yield (XIRR) is 31.5%. This is the highest I achieved on any p2p lending marketplace over a longer duration of time. 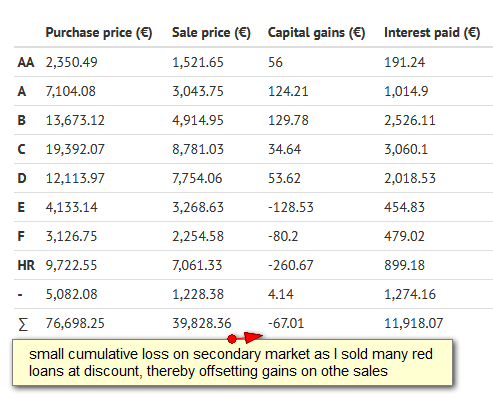 This includes the 110 Euro capital gain caused by sales of loans on the secondary market with premiums (see my article on trading on Finbee’s secondary market). Calculating the result again, this time with assuming a full write-off of the defaulted loan gives a yield of 29.4%. There are 19,930 Euro (as of March 13th) in the Finbee Compensation Fund. Current estimate is that the fund is paying about 9,000 Euro per month on defaulted loans and has decreased about 2,000 Euro from February to March. To grow the amount in the Compensation Fund Finbee will need to increase the volume of new loan originations. I looked into the list of open loan requests this morning and there are currently only 3 consumer loans and 2 business loans open for funding. Finbee recently added business loans to SMEs, but I have not invested in any of these. Fellow Finance is a p2p lending marketplace in Finland. It started 2013 with loans to Finnish consumers, and later added Polish consumer loans and loans to Finnish SME’s. 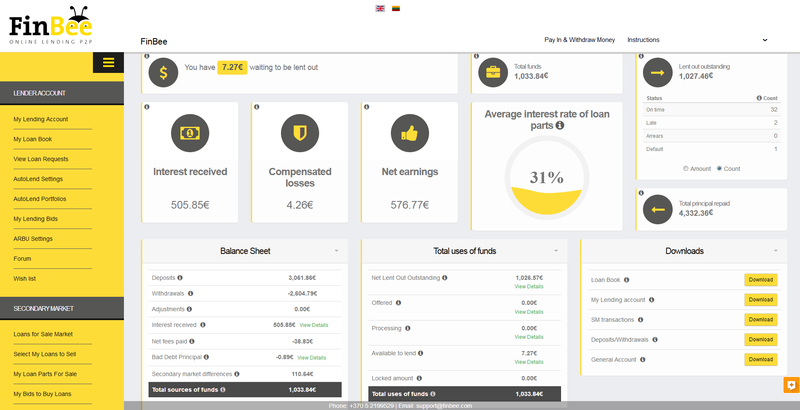 Since launch more than 100 million EUR in loans were funded. See earlier blog coverage on Fellow Finance by P2P-Banking.com. I started a small test investment early in 2016, but really started building my portfolio from autumn 2016. Since then I have deposited 4,000 Euro. I currently invest only in Finnish consumer loans and concentrate on 3 and 4 star loans for which the market rates are currently 13% and 15%. The Finnish consumer loans are covered by a buyback guarantee of 70%, meaning in case they are 90 days overdue, they will be sold for 70% of outstanding principal to a collection agency. My investment on Fellow Finance is conducted solely through the allocator (the autoinvest) function. Basically for me Fellow Finance is a mostly hands-off investment running on autopilot. I do log in at least bi-weekly to check if the market rates have changed. The market rates do fluctate sometimes at +/- 1%, and I felt it necessary to tweak the rate of my allocator then to keep it bidding (at the best possible rate). Fellow Finance is one of the very few platforms, where investors can configure the autoinvest to buy on the secondary market, but I have not used that. Also so far I feel no need to use the secondary market for selling. While several of my loans have gone late, they all catched up and none have defaulted. But my portfolio is still very young so it is bound to happen sometime in the future. The Fellow Finance statistics page gives figures for past loss rates by credit grades. It also shows that interest rate levels have sunk sharply in the end of 2015, beginning of 2016 – I guess I should have started to use this marketplace earlier. Getting money deployed can take a while, as a lot of the bids (loan reservations) are cancelled. I started with 25 EUR bids by the allocator but to speed deployment up, I increased my maximum bid size to 60 Euro. Overall the website – which is available in english language – is good, only sometimes a tad slow to respond. A mobile is needed to receive SMS codes to confirm some actions. My plan it to increase my portfolio by another 1,000 Euro, bringing it to 5,000 and then to reinvest proceeds and see how it develops over time. What are your Fellow Finance experiences? There are over 150 posts on the German investor’s Fellow Finance forum thread. Reviews there are mostly positive in tone. Since my p2p lending investments are heavily concentrated on UK and Baltic services, one of my New Year’s resolution for 2017 was to diversify into other markets. Therefore in January I opened an account at French p2p lending service Lendix. Lendix is a p2p lending marketplace offering loans to SMEs in France and Spain (read earlier articles on Lendix). It is one of the larger players in continental Europe. Signing up was straightforward. While the minimum bid on loans is just 20 EUR, the minimum amount for deposits and withdrawals is 100 EUR. Investors can deposit either via bank transfer or via credit card (limited amount). Depositing via credit card is a nice feature which is rarely offered by p2p lending services. I like it because I can react within a minute to new loan announcement emails. This is necessary too, as many new loans are fully funded within an hour – and there is no autoinvest. Nearly all actions require two factor authorisation by a code sent to my mobile. Lendix loans carry interest rates from 4 to 9.9% and are for loan terms between 3 and 84 months. There is no fee for investors and no withholding tax for foreign residents. 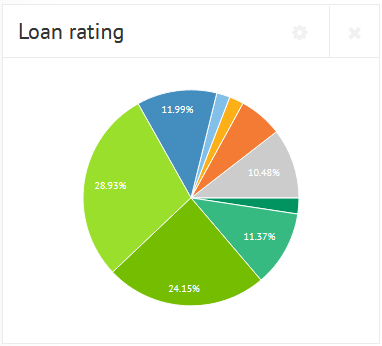 Each loan is assigned a rating score of A, B or C by Lendix. There is also a detailed loan description for each loan. While most of the site is available in English language, loan descriptions and contracts are in French language only. 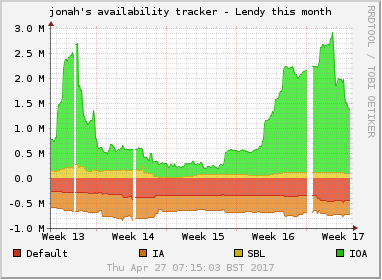 So far Lendix has done a very good job in vetting borrower applications. The default rate to date is low – only 0.11%. However the marketplace is young and growing and I expect the default rate to rise with time. Also it remains to be seen, if the perfomance of the Spanish loan will be comparable to the French loans. As there is no secondary market, investors are bound hold the loan to maturity. I only just started in January. I concentrated on A and B grade loans, putting 100 EUR in most of them and 20 EUR in those that seemed not as convincing to me (e.g. a loan to a hotel that, when I looked it up on a hotel booking comparision site, had less satisfied customer reviews than the four other competing hotels in the same village). I skipped the new spanish loans. Right now I have invested 640 EUR in 8 Lendix loans. I would have invested more, but I found the dealflow to be rather sparse in January and February. My average interest rate is 5.9%. This month I received my first repayment rate. Experiences of more seasoned investors report that repayments are usually on-time. New investors get 20 EUR cashback bonus from Lendix when signing up via this link, once they have invested at least 500 EUR. In October 2012 I started p2p lending at Bondora. Since then I periodically wrote on my experiences – you can read my last blog article here. Since the start I did deposit 14,000 Euro (approx. 17,800 US$). My portfolio is very much diversified. Most loan parts I hold are for loan terms between 36 and 60 months. Together the loans add up to 17,924 Euro outstanding principal. Loans in the value of 2,084 Euro are overdue, meaning they (partly) missed one or two repayments. 1,327 Euro principal is stuck in loans that are more than 60 days late. 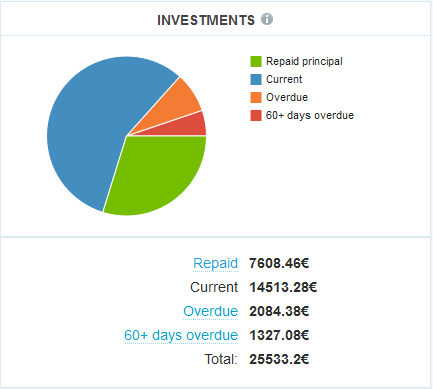 I already received 7,608 Euro in repaid principal back (which I reinvested).